It is the intent of Phillips & Koch Construction, Inc. to provide a safe and healthful working environment for all employees. Phillips & Koch Construction has an outstanding safety record and safety program, never having a fatality! Our goal of achieving compliance with MSHA/OSHA statutory regulations relating to employee health and safety can only be met through mutual cooperation and participation. 1. Compliance of MSHA/OSHA, state, local and client safety and health standards. 2. Establish lines of communication, responsibilities and accountability for safety. 3. Elimination of personal injury and property damage. These procedures, duties and responsibilities outlined in our written safety program will be in effect throughout the company at all times. Phillips & Koch Construction’s safety program is updated frequently in order to meet current changes in the construction industry. Maintaining safety standards benefits all parties involved. Phillips & Koch believes that sustainability begins with the safety and well-being of our employees. Safety is more than a priority – we consider it a value. This strong safety culture that Phillips & Koch has developed supports and encourages our employees to watch out for themselves and one another. 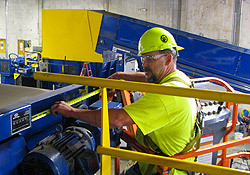 Our employees understand that safety is not something we do in addition to the work. Its how we do the work!